In Praiano's town centre there is the church consecrated to St. Gennaro the Neapolitan bishop of Benevento, who was made Martyr of Pozzuoli on the 19th of September 305. 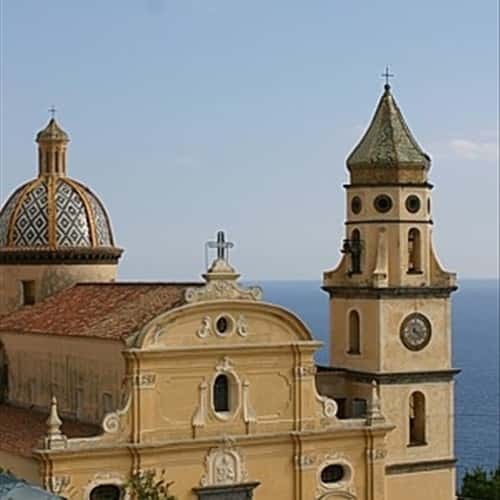 This church was built in 1589 on an existing structure dating back to 1200 and untill 1572 was the property of the Corsario family who were noblemen from Amalfi. The structure is flanked by a bell tower with a cupola covered in majolica tiles. According to Matteo Camera (Amalfitan historian) the new building was completed in the 1602. The structure is divided in three naves, in the right one there are many altars dedicated to the Rosary, the Sacred Family, St. Bartolomeo and the Immaculate Conception (with a Gian Battista Lama Paint dated 1747). On the same side there is also the Sacred heart chapel built in 1898 by Domenico Rispoli- Zingone. On the left nave there are other altars dedicated to the Carmine, San Gennaro, Santa Lucia, the Crucifix, San Michele Archangel (a spiritual place for the fisherman and the seaman in the 1600 and the 1700).